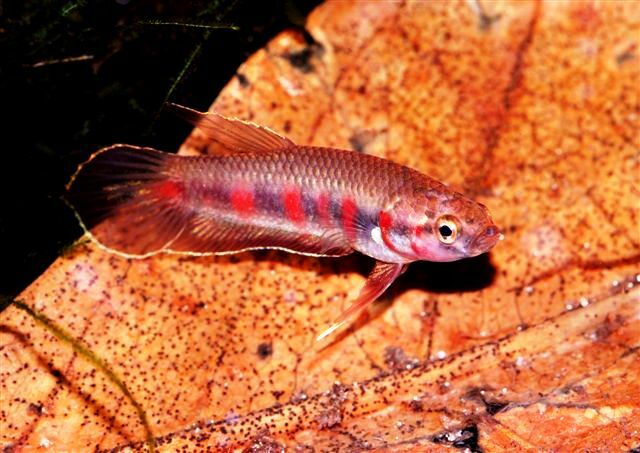 Ingo Schindler and Stefan van der Voort redescribe the intriguing Sumatran endemic species Betta rubra Perugia, 1893 in the new issue of the journal ‘Bulletin of Fish Biology’, published this week. Despite being described over 100 years ago this species remained something of an enigma as for the majority of this time it’s been known only from the type specimens, that is, no live examples had been collected or their appearance described. As a result the name has been misapplied on numerous occasions, and at one point was even synonymised with Betta picta. Although a handful of authors mentioned the species in quite recent works, most notably Witte and Schmidt (1992), who placed it in its own species group, and Tan and Ng (2005) who considered it a member of the B. foerschi group. 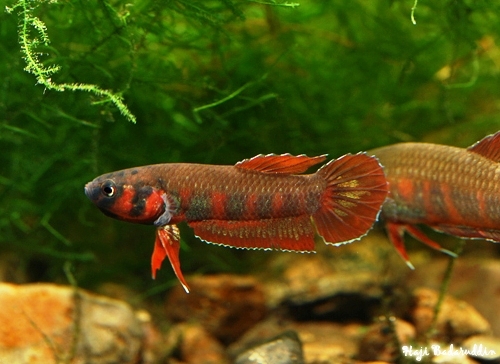 It was not until 2007 that live fish made their way into the aquarium hobby and were an instant hit with enthusiasts since the colour pattern is both beautiful and unique within the genus. The new study thus provides a full resdescription, including for the first time both live colouration and observations of its spawning behaviour, plus some interesting remarks regarding its biogeography. The authors also provide an English translation of Perugia’s original Italian description as an appendix. B. rubra is now placed in its own species group and can be told apart from all congeners by the presence of an iridescent, light blue patch at the pectoral-fin origin in both sexes, a colour pattern of alternating black bars and red blocks, and a broad chin bar visible as a dark, triangular-shaped marking below the eye. For further information please refer to the full paper: Schindler, I., and S. van der Voort. 2012. Re-description of Betta rubra Perugia, 1893 (Teleostei: Osphronemidae), an enigmatic fighting fish from Sumatra. Bulletin of Fish Biology 13(1/2): 21-32. May we also take the opportunity to congratulate Stefan van der Voort who is both a contributor to SF and personal friend. Well done sir! Thank you Herve. Not many around in the aquarium fish hobby you mean? That would sadden me, although I am confident they will turn up again – and there should be plenty still in at least the UK.